[Dec 1] The first conference proceedings contribution has been published in the journal Universe. It can also be found – together with all future proceedings contributions – at the bottom of this website. [Oct 3] More detailed information how to submit a contribution to the conference proceedings has been added. [Sept 29] The Saturday morning lecture “Where do the laws of physics come from?” by Paul C. W. Davies has been published on Youtube. - Go to the timetable, make sure that “Detailed view” is activated, click on the paper clip symbol next to the title of a talk and a link to the PDF will appear. - Go to the contribution list, search for the respective talk, go to the webpage of the talk and you’ll find a link to the PDF below the abstract. [Sept 15] You can watch today’s public lecture by Paul C. W. Davies “Are We Alone in the Universe?” on Youtube. [Sept 9] You can download the conference programme here and a PDF version of the helpful clues here. took place in Szczecin, Poland from 12th to 17th September 2016. (the previous ones were Multicosmofun’12, Grasscosmofun’09 and Cosmofun’2005). 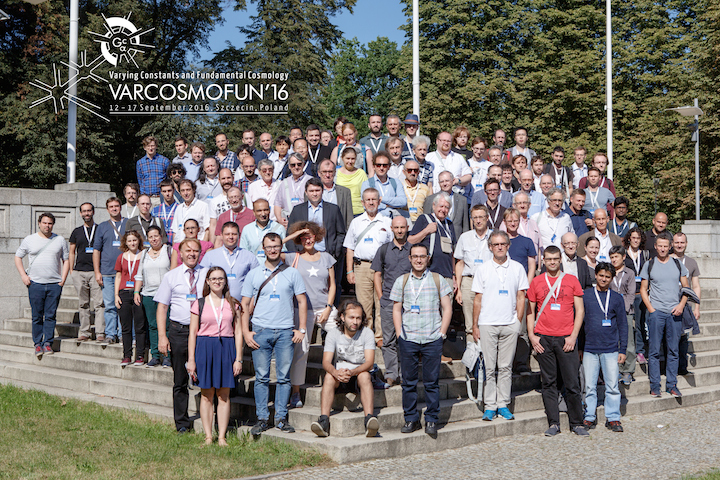 This time the aim of the conference was to bring together specialists dealing with the problem of varying (dynamical) physical constants and a broad range of other topics in Fundamental Cosmology, who wanted to exchange the current ideas in these topics. The program of the conference contained 5 plenary morning sessions with invited lectures and 10 parallel afternoon sessions with contributed talks. The last day of the conference was devoted to philosophical aspects of the variability of physical constants and the frontiers of physics and cosmology. Conference proceedings will be published in the MDPI journal Universe and by Copernicus Centre Press. in collaboration with the Polish Physical Society, the Copernicus Center for Interdisciplinary Studies (Kraków), the National Centre for Nuclear Research (Świerk) and the Maritime University of Szczecin.